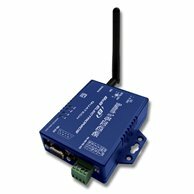 Featuring Bluetooth wireless technology, the SS-BLT-100PR (PR=2 Bluetooth Master/Slave Config Auto Pair) is the ideal replacement of the standard RS-232 cable. With standard RS-232 interface, it can be easily adopted for industrial machines with RS-232 interface. It is compatible with all Bluetooth V.2.0-certified and is backward compatible with v1.1/1.2 devices. You can connect between your computers (Master) and RS-232 devices (Slave) 100 meters away without cables in your working environments.